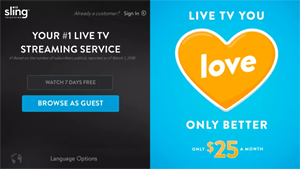 "New Sling TV users can now try Sling TV and watch free on-demand content without entering an email or credit card information," according to the Sling TV announcement. "When opening the Sling TV app on a Roku device, new Sling TV users can click “browse as guest” to launch the Sling TV interface, where you can browse and watch ribbons of content from 'My TV.'" Free content currently includes episodes of "Shameless," "The Affair," "Billions," "Ray Donovan," "The Big Interview with Dan Rather." Pay-per-view events include the upcoming UFC events, and over 5,000 movie titles can be rented without a Sling subscription. À la carte options include Showtime and NBA League Pass, as well as channels like Stingray Karaoke, Curiosity Stream, Docurama, and more. For all users, Sling TV has updated their search interface for Roku, Android TV, and Amazon. Search results will now be organized into categories like Top Results, Movies, Shows, and Channels. Sling will also be launching a binge-watching feature that prompts you to watch the next episode in a series. The next episode will automatically play if you don't take any action within ten seconds. The binge-watching feature will be available on Roku devices within the next few weeks, with other devices to be added in the future.